We focus specifically on building custom homes in Mooresville, NC, so every aspect of your project will reflect your personal style and taste. architect or designer, we enthusiastically seek to work and build relationships with professionals who share our commitment to quality and value. We focus specifically on custom homes, whether large or small, so every aspect of your project will reflect your personal style and taste. 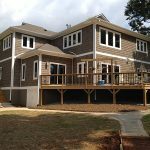 No matter what type of custom home design you choose, once the project begins, we will be a continuous advocate for you throughout the building process. When you build with Chad Goodin Signature Homes, you get more than a construction crew–you get all of the knowledge and experience we have acquired in creating beautiful custom homes. We put it to work for you every day, and we will be with you every step of the way until your dream home is complete and ready for move-in. We will take time to understand your vision for the project, and we will offer ideas throughout the process – from concept to completion. We will walk lots with you until you decide on the perfect lot, and we will listen carefully to your needs, your wants, and most importantly, your dreams. We will hand you the keys to your new custom home only after we know that everything is as you hoped it would be. Our service area includes Mooresville & Lake Norman, North Carolina, and the surrounding areas. Please contact us today for more information about our custom homes! At Chad Goodin Signature Homes, we can build beautiful custom homes in Mooresville, Cornelius, Davidson, Huntersville and the surrounding Lake Norman area of North Carolina.